Diablo's new ultra thin kerf Combination saw blade.The ATB Grind + Raker tooth design allows for straighter rips and improved performance. The deep gullet design allows for cutting thicker stock while maximizing number of teeth. Blade features Frued's TiCo Hi-Density carbide for extreme durability and cutting life up to 4 times longer than standard carbide, Perma-Shield Coating for less drag, gumming and corrosion, Laser Cut Stablilizer vents for less vibration and quieter cleaner cuts, Tri-Metal Shock Resistant Brazing to withstand exteme impact and you have a saw blade that "Cuts Like a Hot Knife Through Butter". 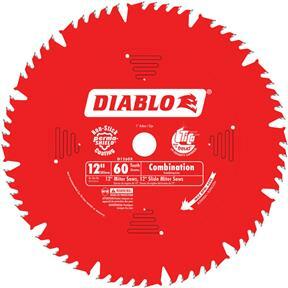 12-Inch diameter, 60t ATB/R, and 1-Inch arbor. I bought this for someone else & they said it worked good & was a perfect fit. Easy to order online!